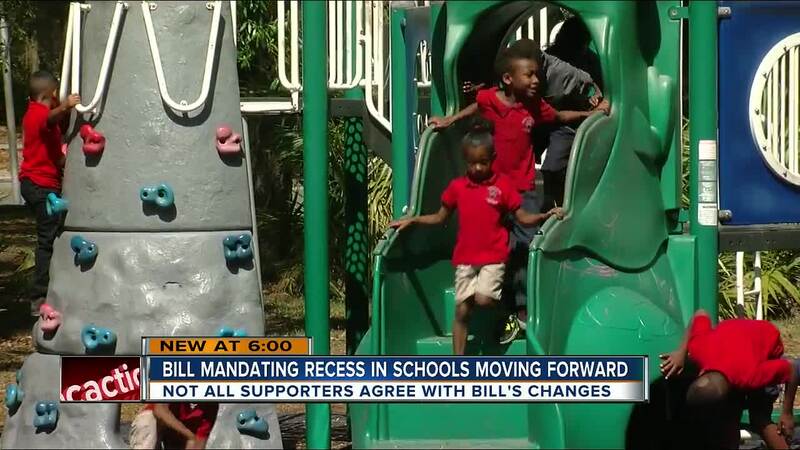 Changes to a bill making its way through the Florida house and senate could leave some "recess moms" unhappy. 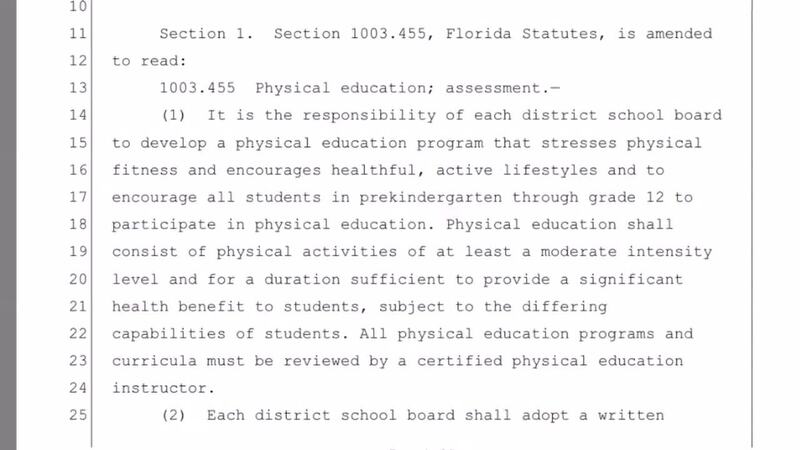 When submitted, the bill aimed to require all public schools in Florida, grades K-5, to provide 100 minutes of recess time in a week. That equates to about 20 minutes a day. 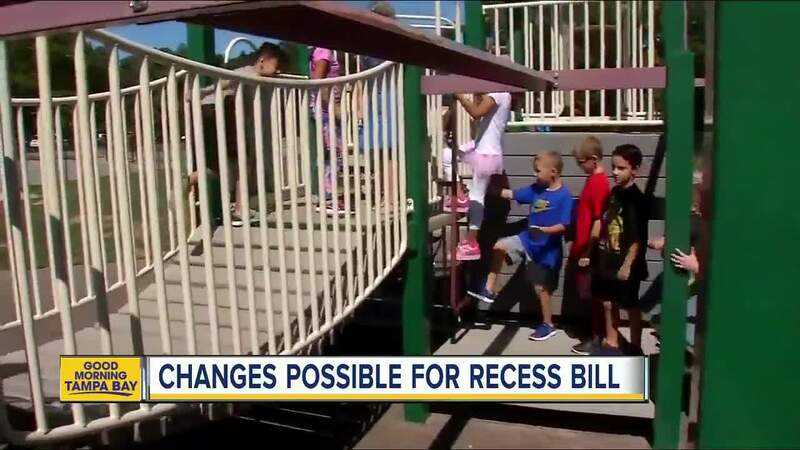 The bill has gone through the senate smoothly, but Chris Latvala a house representative out of Clearwater, suggested amending the bill allowing personal education to count towards recess requirements. It would extend the requirements to 150 minutes, but free play could only count for kids in grades K-3. The amended bill would call for 20 minutes of free play on days when personal education isn't scheduled. The amended version of the bill was approved by the PreK-innovation subcommittee Tuesday afternoon. It will now move on to the full education subcommittee before going to the house floor for a vote. Quitoria Combs and her two-year-old son love to get outdoors and she says having free time is important. "There's a lot of obesity and things like that going on. You want them to have that type of activity," said Combs. Not everyone agrees the state should mandate recess though, especially some Bay area principals. Matt Torano heads the Community Charter School of Excellence in Tampa where his students have recess every day. "When you make something mandatory that means it has be be enforced," he said, "Who enforces it? How do they enforce it?" Instead, he prefers the state offer a reward system for schools that do offer a 20 minute recess for students, instead of punishing those that don't. "It's good for the kids," he said, "the kids need it." He says it would be especially challenging to change curriculums to meet the state's guidelines. However, he's happy to see parents voicing their concern for their children to have time outside, which he doesn't object to, in fact thinks is necessary. "I mean if you've ever been to an adult conference when there's a key note speaker standing in front," he said, "how long do most adults go before they start getting their cellphone?" Child and teen therapist Stephanie Moir goes further to say kids need recess for their social development. "It gives them their kind of autonomy," she said, "and the ability to develop without our structure." Juliet Reyes says her son Lucian has a speech delay and getting outside with other children helps him learn how to interact with other kids. "I think it's going to be great for children and also for parents because they will have free time outside and I think it will teach the child that there are other ways to learn," said Reyes. "I think it's going to be great also for teachers so they can have a little break too." The bill needs to make its way through committees before heading to the house floor for a vote and will need to match the senate bill. If not, the senate and house will have to come to an agreement or nix the bill altogether.